Confirmed drop off Eredar Supplicant west of Illidari Stand. Took around 60 kills. Found a little tidbit. Though this submission is based on Beta and subject to change. "The Grimoire of the First Necrolyte" is a drop in Azsuna that begins a quest. The only known report of it dropping came from an Eredar Supplicant, which can be found in Faronaar. The quest requires you to gather thirteen "Skull of the Executed", which seem to drop from the elite rare spawns that can be found throughout the Broken Isles. Generally the Wardens will target one or two each day as a world quest. It's unknown what happens after thirteen are found and the quest is completed, but the quest log certainly indicates that the Ulthalesh hidden skin is the ultimate reward. If this appearance follows the pattern of other Hidden Appearances that have shown up in game, you DO NOT need to be Affliction spec to loot it. Obviously this is not 100% confirmed yet. Does this drop for a warlock NOT in affliction specialization? Or if one didn't have affliction as loot specialization? Someone at the warlock discord just posted a screenshot confirming a drop for Grimoire of the First Necrolyte to start the quest line. He was farming Eredars in western Highmountain near Felbane Camp Flightpoint for the Demonology hidden artifact skin. Trigger seems to be Artifact Knowledge 5. This Grimoire can drop from any eredar mob on the Broken Isles, as people have found them all over the Broken Isles - from Highmountain to Azsuna. A lot of people have had luck by killing the eredar in Highmountain whilst also looking for the Demonology hidden skin, which is where I found mine. There is also a theory that the higher HP eredar mobs have a higher chance of dropping the item (such as the ones in Highmountain), but this is just speculation at this time. Here is a screenshot of my first skull drop: http://i.imgur.com/JQ6ZU8i.jpg . As you can see it comes as bonus loot, not the mob itself. Got Grimoire of the First Necrolyte today(25.09) from Eredar Supplicant, accepted quest and started farming those skulls, but after completing 2 local quests (Blue elite ones for rares - one in Azsuna, that i can't remeber, and Lytheron) did not get any of the Skull of the Executed, what's the problem behind this? upd: Does Skull of the Executed drop only from Humanoid Rare Elites? So I decided to farm this as affliction, and after 20 minutes I ended up stopping and logged for the night. Came back and switched to destruction (my primary spec) and it dropped from an Eredar Supplicant on my first kill of the day. So you don't need to be affliction for this to drop. Video showing what do to with the skin! Getting the low drop chance of skulls from bosses. Favorite current hidden. Very much worth it. 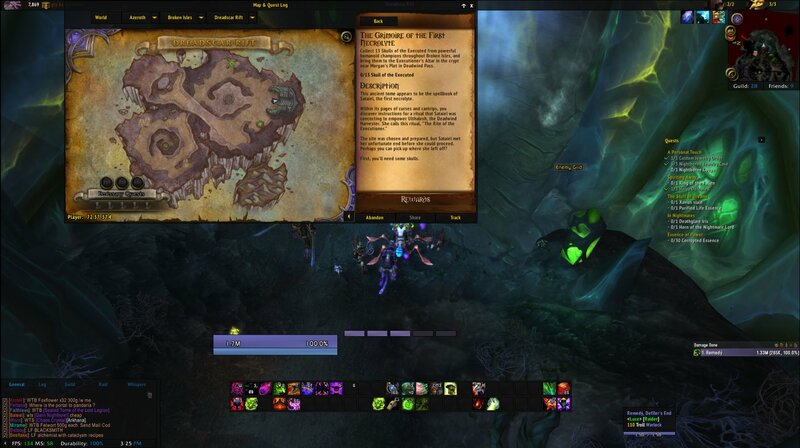 Now if they would fix Affliction or be able to xmog other artifacts on top of artifacts would be great. You can do the whole thing using another spec, including killing Sataiel. Also, unlocking color variations of a hidden appearence will unlock the respective color variation for other artifacts hidden appearences, except for the original color. Here's a list with all the World Quest you can get a Skull of the Executed from, after you looted the Grimoire of the First Necrolyte from any eredar mob on the Broken Isles which starts the The Grimoire of the First Necrolyte quest. You have to be at least Artifact Knowledge Level 5 in order to loot the grimoire. I just got this on 7.1.5 while (successfully) farming for the Demo hidden spec. Something must have changed, because the skulls did NOT drop for me while in demo spec. 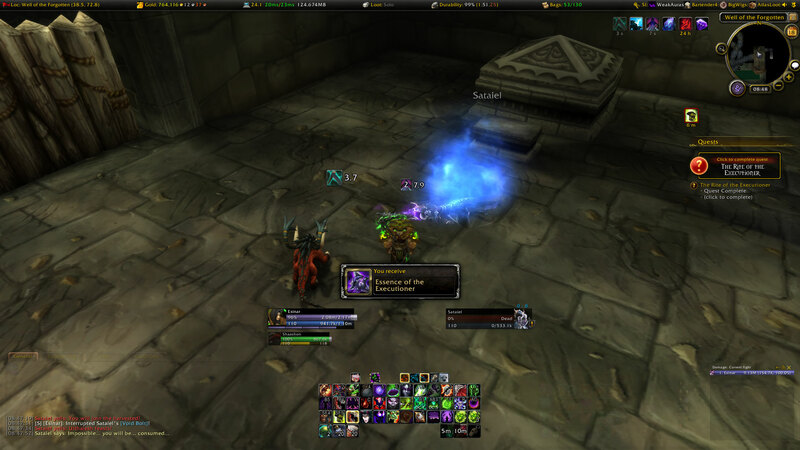 But, the moment that I switched to Afflic spec, I got a skull to drop. Maybe the skulls don't drop in other specs when its hidden appearance is active? So, be mindful that if you're not getting any skulls to drop in Demo or Destro, try switching over to Afflic & see if you can get skulls. It appears as though the "rare" or boss world quests during the 7.2 invasions do NOT drop the skulls. In saying that, I have only tested this on 3 bosses so far. I can confirm that World bosses and WANTED quests do NOT give skulls. Witchdoctor Grgl-Brgl counts as well. Edit: After 7 hours farming, I discovered I already had the quest in my quest log, I don't know when I acquired it but I think it was before I created the tracker so I am unfortunately unable to attest to it's efficacy. If you do use this tracker and have success with it, please do post your results. Greater Invasion Point: Mistress Alluradel didn't count in case you may be wondering. It no longer drop on 8.0.1 currently, don't know if it is bugged or intended. Use: Unlocks the Fate's End appearance for Ulthalesh, the Deadwind Harvester. "Distilled from the skulls of great champions, this essence offers great power to those willing to pay the dark cost."